The waves lapping the sandy shores and stunning sea views become part of daily life when you jet off to the Balearic Islands. 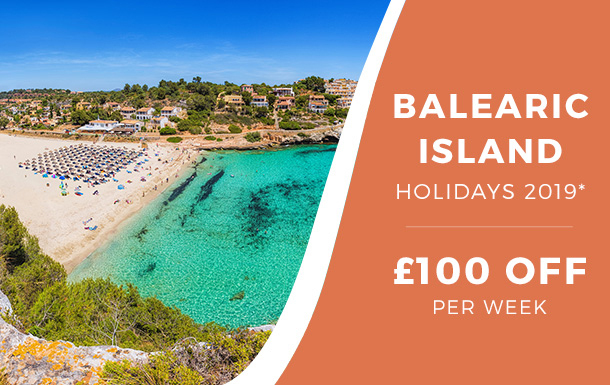 If you’re planning to head there for summer 2019, not only will you get FREE car hire and FREE airport parking* with our 2019 offer – we’re also giving you an extra £100 off a week* for choosing this idyllic island getaway! Go all–out with a villa perfect for large groups. Holiday with friends for a special occasion or bring the whole family together for a well needed break in a villa with plenty of space. There's over 300 large villas to choose from, so find one to suit you. Plus by booking 2019 now you'll get FREE Car Hire and FREE Airport Parking* only for £100pp deposit. Our Villas collection is about swimming, eating, or simply doing nothing but relaxing. We offer everything from cosy one-bedroom hillside hideaways to six-bedroom villas with enviable ocean views. With a large pool and beautiful gardens, 10 of you can spend your days relaxing in the Mallorcan sun or playing a game of table tennis. And when night comes, you can cook up a feast on your barbecue and dine al fresco. This Luxury collection villa is modern both inside and out. The stylish open plan interior flows effortlessly outside to the large pool complete with amazing sea views. The nearby beach is only a short walk away too. With views across olive groves and down to the sea, this breathtaking villa definitely ticks all the boxes for a true Greek getaway. Enjoy the tranquillity of your own grounds or drive to nearby Rethymno for a day of exploration. Villa d'Avo offers amazing countryside views of the Algarve with a shop and restaurant only a short walk away. The large grounds give plenty of space for 10 of you to enjoy the pool and rustle up light lunches in the shaded terrace. Deluxe furnishings and all the mod cons you'll need are part of the package at Butterfly Villa. 12 of you can enjoy this Luxury villa with breathtaking sea views providing the perfect backdrop for radiant sunsets. Rustic and traditional, Villa Podere Orsini has true Tuscan charm. This farmhouse will have you living the Italian lifestyle filled with relaxation and lazy days by the pool. Nearby you'll find rolling hills, quaint villages and historic relics to discover. We may be enjoying 30 degrees in the UK but without soft white sand and azure seas mere footseps away from our back doors, it simply doesn't match up with a luxurious beachfront break! Beach acess is one of our most requested facilities, luckily you can search our website to find properties located on or near the beach. A villa holiday is perfect for all seasons. Your very own home away from home has everything you need, no matter the time of year. Sunbathe in summer by your own private pool, or use your villa as a base in winter to explore the sites once the crowds have gone. To help with your holiday planning, here's our seasonal guide to the best destinations for your villa holiday. Head to sunnier climes with a summer break! Whether you want to be relaxing on a beach in Mallorca or filling your days with activities in the Algarve, no matter your holiday style choose a destination to suit you. If you need to keep those winter blues at bay, we’re here to help with a winter sun holiday. Swap jumpers for sarongs in the tropical Caribbean or for a trip closer to home Cyprus' temperatures are perfect for day trips galore. The trees are turning green and flowers are starting to blossom – it's time to come out of winter hibernation. For some springtime fun in the sun jet off to Malta or Sicily and start topping up your tan ahead of the crowds. Extend your summer with an October escape. Greece still offers warm days perfect for the beach or head to mainland Spain for days filled with cultural excursions. Either way there's still sun to be had in many of our destinations. Book your villa and jet off with easyJet flights now on sale! Travel between 25 March & 01 September 2019 and select your seats at the same time on the majority of flights. Rugged coastlines, Blue Flag beaches, and towering mountains – the Greek island of Kefalonia is a wonder to behold. Add in friendly locals, quaint hilltop towns and delicious food and you have the perfect recipe for a villa holiday. This delightful, modern property comes highly recommended and is one of four well appointed properties, that sits within pretty countryside surroundings of Trapezaki. Georgia has been furnished to a good standard and boasts fabulous panoramic views of a dramatic mountain backdrop and wonderful views over to Zakynthos. A small selection of amenities can be found scattered around the surrounding area all within a few minutes drive. With fabulous views of the sea and countryside, and surrounded by forests and fields, this really is a hideaway escape! We are delightled to be able to offer this recently completed villa, spacious, elegant and comfortable, it offers an oasis of peace and quiet with a generous sized swimming pool at the front, and plenty of terraces for sunloungers and umbrellas. Situated in between Trapezaki and Lourdas, this delightful property is located within a small community and enjoys a wonderful mountain backdrop and views out to the sea. Comfortably furnished throughout, Marina offers a convenient location close to a good variety of amenities which can be reached within a 15 minute walk. Ideally located on the outskirts of Skala village and its lovely 5km beach, this delightful property is perfect for those wishing to be close to the charming fishing village of Skala and enjoy its wonderful variety of shops, restaurants' and bars without having to drive. Villa Anna has been comfortably furnished throughout, offering open plan living, dining and kitchen areas that enjoy large patio doors leading to the swimming pool - both villa and pool area are surrounded by lovely mature gardens, shrubs and trees. This impressive property enjoys a fantastic location, set on a small headland, which boasts some of the most impressive views across the south of the island - from awe-inspiring views of Mount Enos, to the breathtaking view over St.Thomas bay and along the picturesque coastline to Lourdas in the distance. A short 5 minute walk to Trapezaki beach with several tavernas and shops close by make this comfortable contemporary villa a delight from start to finish. The swimming pool and terrace are surrounded by lawns in a walled garden to the side of the pool, perfectly placed for outdoor dining and catching a breeze in the mid-day sun. Umbrellas and sunloungers offer shade as well as the olive trees that stand guard around the villa boundaries. Complete with their own private pools our Gozo Farmhouses have a unique character and charm all of their own. 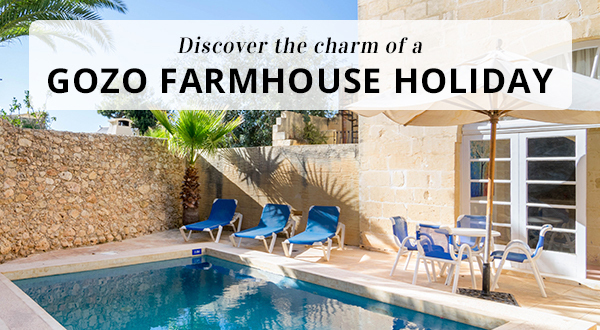 A Gozo Farmhouse holiday is perfect for those travelling with family or a group of friends. Our collection of Gozo Farmhouses have been carefully handpicked and all include flights and transfers. Bursting with traditional features, including high arched ceilings and tiled floors our 3-Bedroom Gozitan Farmhouses offer a completely different holiday experience to a traditional hotel. Facilities include a swimming pool, kitchen & living area, TV, Wi-Fi and telephone. With plenty of authentic traditional features, including original stonework and archways, these houses are full of charming character. Facilities include a swimming pool, kitchen & living area, TV, Wi-Fi and telephone. Switch signature bakes for a Signature villa so you can indulge in a holiday with the 'wow' factor. Our Signature collection properties have a host of extra features, plus those unique added details which make them special. Just ten minutes in the car from the bustling resort of Puerto Pollensa, La Finca feels a world away from the hustle in its peaceful location surrounded by woodland. The three bedrooms, large gardens and playground make this villa a perfect choice for families. Recently renovated, this stunning villa with views across Kalkan Bay truly has the 'wow' factor. The mini–indoor pool, romantic bedrooms and modern interior are just a few of the reasons this villa boasts our Signature badge. Mahmut sleeps ten and has all the facilities for a relaxing fun holiday with an unbeatable backdrop. Lawned gardens surround the lovely Villa Baccio, positioned in the small village of Vrecari, Istria. The inviting large pool is a real gem, while inside the villa is furnished with a traditional and homely feel. Baccio sleeps seven and is just a short drive from the popular town of Labin where you'll find great restaurants. Designed with outdoor living in mind, Villa Two Towers is as unique as its name. You'll find this four bedroom home from home in the sought after resort of Vale do Lobo, although exploring might not be on the agenda as you could easily spend the whole holiday around the large private pool and in the games room. Views out to the picturesque Cretan countryside from your sweeping private pool, what could be dreamier? Only a 15 minute drive from the town of Reythmno, Villa Artisit is in the perfect location and comfortably sleeps eight. Make a splash in the newly built swimming pool for 2018! Highly desirable with a fabulous location, Villa Pietra enjoys stunning views of the sea and is right on the doorstep of a small, sandy cove. Sleeping nine beach lovers, laze away the days with your feet in the sand or relaxed around your private pool. Danae is newly built for 2019 and new to James! Situated in the stunning Elounda region, this villa is pure Luxury. Beautifully finished inside and out, Danae sleeps eight. Villa Las Vistas sits in the perfect spot to make the most of the stunning views over Mijas Costa. Large, modern and with a host of fun facilities, Las Vistas is the perfect home from home in the Costa del Sol. Sleeps seven. What a view! Galene Beach Villa backs onto the sand and sea of Harmonia Beach. The beautiful grounds, chic interior and spacious rooms to sleep eight means it's a firm favourite with Cyprus guests. La Espanola is one of our Signature villas, with amazing views, comfortable furnishings and plenty of sunbeds! The lush gardens will be a real highlight for you and your chosen few. Sleeps eight. Bring the whole family to Villa Buena Vista Bocaina! This villa sleeps ten and has ample space inside and out. A huge private pool, hot tub, games room… that's just the start. Discover what else this villa has to offer. Situated in the small town of Ovacik, Unique Villa is a gem from which to escape it all. Sleeping eight, laze the days away around the private pool. Grab your camera to snap the interior that's as unique as the name. Ideal for couples, Villa Marina Epavlis sleeps two. The picturesque property sits on the East coast of Kefalonia, ideal for making the most of the Greek sunshine. Ruana has it all. The large pool is so inviting, while inside all the modern essentials are there for a relaxing holiday. Take a walk to the beautiful beaches of Castelo. Ruana sleeps ten. Scattered in the Ionian and Aegean Seas, the Greek Islands are perfect for any getaway. Whether you’re looking to absorb the stunning sea views or enrich yourself in history and culture there is something for every holidaymaker. A Cyclade spectacle that is a must-see, Santorini is often labelled one of the most beautiful destinations in the world. Blessed with a collection of white–washed houses carefully carved into the cliff face, a combination of beautiful lava pebbled beaches and the Greek authenticity to match – Santorini could be the closest thing to heaven! Take sanctuary in stunningly serene Kefalonia. Surrounded by sapphire blue seas, unspoilt beaches and a host to some hidden historical gems Kefalonia is quite literally a floating paradise. The largest of the Greek islands – Crete is definitely larger than life. Discover the unique cultural city of Chania, famous for its Venetian Harbour, the old port and narrow streets or drift away in the dreamy villages which sit in the rugged landscape. Crete is a culture hub waiting to be explored. A cosmic blend of cosmopolitan and tradition, Rhodes sets itself apart from the rest. Luscious green valleys, uninterrupted coastlines and home to one of the largest medieval towns in Europe, married to a bustling culture – Rhodes is one to tick off your list in 2019. Deep, verdant valleys, rugged mountainous landscapes and with almost 200 Caribbean–style beaches – you wouldn't believe there is such a peaceful paradise just a stone's throw from the UK! Whether you'd like to explore the cute harbour town of Porto Vecchio (Corsica's own Cote d'Azur), or the majestic medieval town of Calvi… let this French island take your fancy and discover the laid–back lifestyle of Corsica!